The Most Complete Aviary and Cage Cleaner. 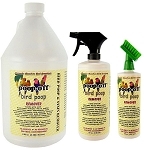 Pet Focus Aviary and Cage Cleaner is a blended proprietary formula of surfactants to break down bird poop. 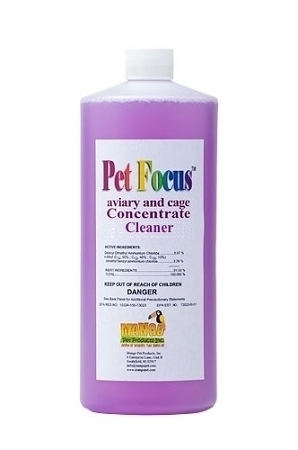 One Quart of Pet Focus Aviary and Cage Cleaner Concentrate makes 32 gallons of solution! Good cleaning helps to safe guard against cross contamination. Spray on, wipe off or air dry! Just rinse to use on feeding dishes or syringes. Less time you need to spend cleaning is more time with your bird. Non-Toxic when dried. No Rinse needed!